Yesterday I attended the David Corbett workshop and it was motivating. We had lots of new faces who came from long distance to attend. The furthest was Chicago but also, Kansas City, Iowa City, Omaha, and northern Iowa. David based his workshop off of his current non-fiction book – The Art of Character. He had some great insights on using your feelings and emotions to create characters who are more than flat paper dolls you move around in your scenes. For more in depth details, do check out his book. The workshop was perfect timing. 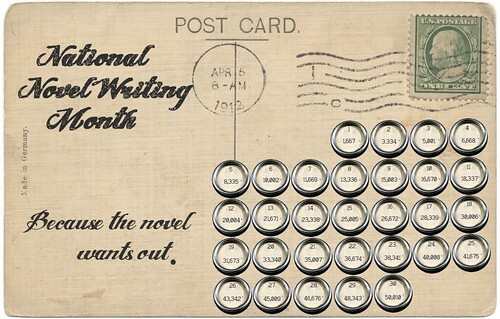 I always leave inspired to write and with this being November and Nanowrimo, that is exactly what I intend to do. I am working on a romantic comedy that I have had half finished for a while. The characters keep calling to me so finally decided if I am ever going to be able to write anything else, I have to finish this project. We have a very active Nano group here in central Iowa. We have write-ins every day in both the Des Moines and Ames area. I plan to attend this afternoon in West Des Moines to set my word count on fire. Maybe if I can get that flame hot enough, I can put – The End to this project. Just so you know. Amy Tan will be in Des Moines on the 11th as the final author for the 2013 AVID program. She will be at Hoyt Sherman Place at 3:00. Hope to see you there.